The last contact center slideshow that appeared here on No Jitter, Top Contact Center Stories of 2017, had the subtitle: "Artificial Intelligence Groundswell." If AI's importance to the future of customer experience software could be compared to a rolling of the sea last December, by this July it's an outright tidal wave. Nowhere was that more evident than at last week's Google Cloud Next event. The company reported that 25,000 people attended -- either in person or via the hours of streaming keynotes and breakout sessions on its in-house network, YouTube. One of the key announcements relevant to No Jitter readers was Contact Center AI. 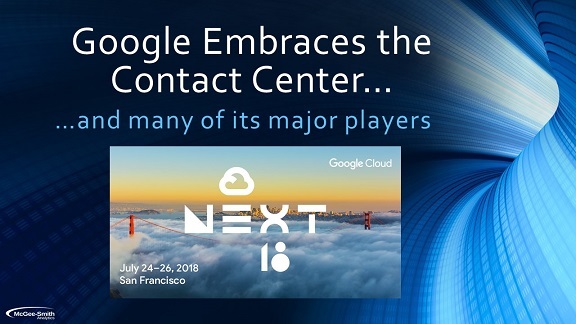 You can read the highlights of the announcement in my post, "Google Enters the Contact Center AI Fray," and in one from my colleague Dave Michels, "Google Clouds Enterprise Communications."